The United Arab Emirates is becoming famous as a great place for American expats to move to. Some people believe moving to UAE is difficult, but with the right help you can move your entire home with no hassle at all. UAE has no taxes other than a small VAT while having high salaries for expats. This along with great job opportunities is driving a lot of Americans to relocate to the UAE. With over four decades of experience, Schumacher Cargo Logistics has completed thousands of moves to the UAE. We have streamlined the moving process, helping us deliver our customers the best value for their shipment. Read our UAE moving guide below and start your international move today! Countless Americans wonder how to move to the UAE, but the process is actually straightforward with the right shipping company. Follow the steps below for a stress-free move to your new home in the Emirates. With our consolidated shipping service, your volume of goods determines the cost. This means the best place to start is estimating the volume of the goods you want to ship. We have premade selections from 10 boxes all the way up to a multiple room home which encompasses a large range of moves. Otherwise we also offer a Household Goods Volume Calculator to create a more accurate quote. Using your estimate size, you can request your price to move to UAE. Use our Online Quote Form or call in at 562-408-6677 to get your free quote today. The price changes based on the details of your shipment, which means each move will have different costs. For this reason our representatives create custom quotes for every move to make sure you get the most accurate information. To illustrate, the price to move to Dubai may be different than the price to move to Abu Dhabi even for the same goods. Once you’re ready, we can either pick up the goods from your home or you can drop them off at one of our warehouses. The goods will start the loading process and will ship as soon as the container is ready. After the vessel departs with your goods, the Bill of Lading and a confirmation of departure get sent to you. When arriving in UAE, your goods enter the custom clearance process. They are then brought to a warehouse and unloaded from the container. From there the goods can either be picked up or we can deliver them straight to your door. After receiving your goods, all that’s left is it to enjoy your time as an expat in the UAE. The UAE offers Americans a great opportunity while also letting them live a very similar lifestyle. Arabic is the native language for the United Arab Emirates, but most people speak English in the major cities. This helps Americans have a lot more comfortability while living here. Most expats who move to UAE are moving to Dubai or Abu Dhabi. These Emirates have international presence with the largest expat populations. Currently expatriots make up the majority of the population in Dubai. At these locations, functioning on English alone is possible. Here you can find any amenity found in America and the adjustment should be easy. Living in Dubai is much flashier, but Abu Dhabi will also be similar in quality of life. All of the Emirates: Abu Dhabi, Dubai, Ajman, Fujairah, Ras Al Khaimah, Sharjah, and Umm Al Quwain. 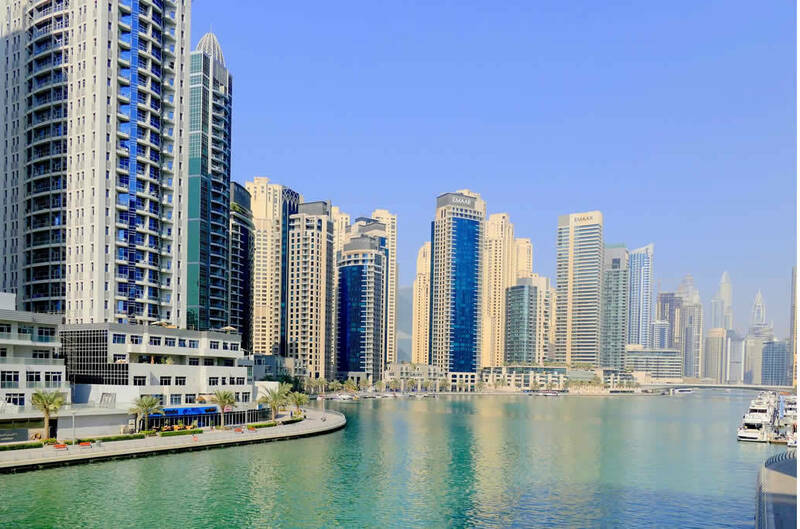 The cost of living in Dubai and Abu Dhabi will seem high at first glance. However because there are no taxes, your money actually stretches further. Another issue that distorts this number is the housing situation. Most people will not be able to afford a house and must live in apartments. These can seem expensive at first, but they are actually very spacious and have a ton of amenities for the value.